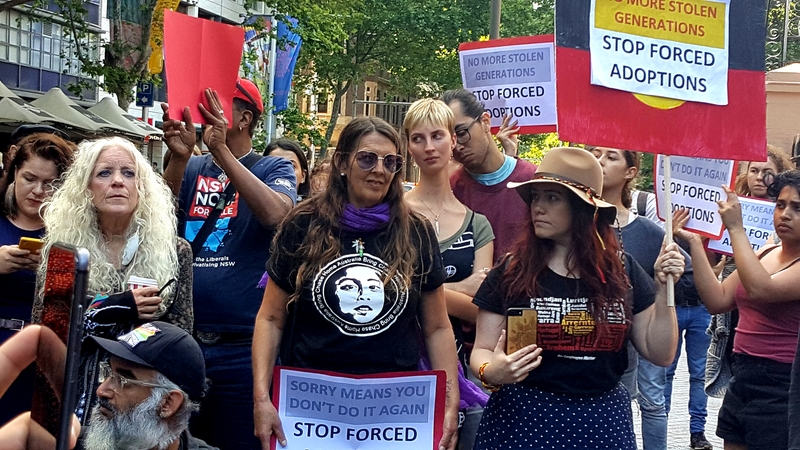 The NSW Government celebrated International Children’s Day, October 23, by passing legislation through the Lower House to permanently steal children. So said Greens MP and long-term campaigner against continuing stolen generations, David Shoebridge, to families and supporters outside Parliament House on Wednesday. The next day legislation passed the Upper House. It means, that after two years in foster care, children will be put up for adoption without their families’ permission. Forced child removals from Aboriginal communities are higher than they’ve ever been. Aboriginal Peoples have led resistance to this policy which threatens all families who live in poverty. Gamilaraay and Birriwaa man Raymond Weatherall told the rally that promises were made but not kept. “Think of the most pure existence. That’s children,” he said. She said her People have been fighting this again for six or seven years. “We lived assimilated lives. We had jobs. We owned our own homes. We didn’t have drug or alcohol problems and still our children were stolen. “They never ever listen to us. They don’t even listen to their own research, their own statistics. “Kids don’t do well in out of home care… Why do they think a piece of paper to say ‘you are now adopted’ is going to stop these kids longing for their families? They’re running away to come back to their families. “We don’t just fight for Aboriginal children. We fight for all kids,” she concluded, rightly calling it genocide. The Minister for Family Affairs, Pru Goward had some apt words, proving his statement. “Unfortunately, there are some parents that continually apply to a court to stall the adoption process,” she wrote in the Daily Telegraph, calling it ‘destabilising’. According to Guardian Australia, “While the minister has said the changes do not target Aboriginal children, Goward’s department has published a “pathway to adoption of Aboriginal children in NSW”, which outlines the approach for caseworkers to follow. Goward said that a target of more than 1,000 open adoptions from out-of-home care over the next four years has been set. Gibson said forced adoption is a form of privatisation. The foster care system is expensive, but adoption outsources costs to those adopting children. He said groups of workers from the Public Service Association, the CFMEU and the MUA had rallied to oppose the legislation. Eighty community groups had publicly said no to it. Tim Ireland, chief executive officer of AbSec (Aboriginal Child, Family and Community Care State Secretariat), says the rate of Aboriginal children in out of community ‘care’ is 10 times that of other children. Nearly 40 percent of children in out of community ‘care’ are Aboriginal. Ireland says is there were ‘no serious consultations in the lead-up to the legislation.